Many years ago I saw the Henry Selick movie based on Roald Dahl book and I fell in love with it. When I read that a musical based on the same material was on its way to the stage I became very curious. 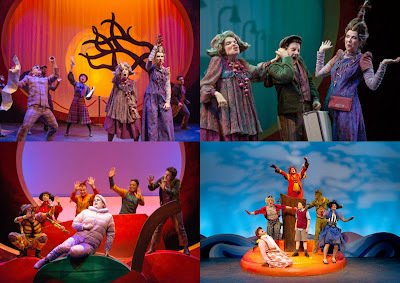 After a workshop production in 2010, the show debuted at the Kennedy Center’s “New Visions New Voices” festival in 2012 and had its world premiere at the Seattle Children’s Theatre in 2013. 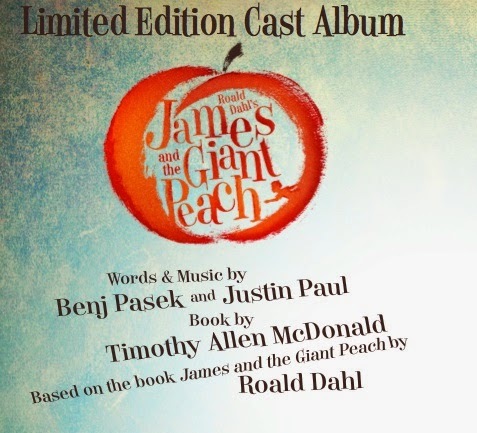 For this studio cast recording, the composer and lyricist team of Benj Pasek and Justin Paul (A CHRISTMAS STORY) managed to assemble a cast of Broadway veterans that bring life to the colorful characters of the story. It all starts with a true “Overture”, something that seems to be missing in contemporary musicals, that is followed by “Right Before Your Eyes”, sung by Marc Kudisch, that sets the tone for this enjoyable recording. Kudisch also leads the company with “Shake It Up”, which sounds like a kind of Bob Fosse number. 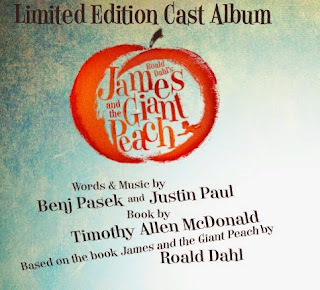 There are melodious lullabies like “On Your Way Home”, sung beautifully by Luca Padovan as James, or “Everywhere That You Are” led by Megan Hilty and Christian Borle. Jackie Hoffman and Mary Testa show us their funny side with the vaudevillian “Property of Spiker and Sponge” and also shine with “I Got You”. “Floatin’ Along” and “Have You Even Begun to Wonder?”, where Brian d’Arcy James can be heard, are two good ensemble numbers that share a contagious rhythm and there’s also a Brazilian number, “Plump and Juicy”, where Daniel Breaker has it’s big moment. Attention: Right now the album is available for free download at jatgp.com.